Think you have what it takes to win one of our infamous eating competitions? 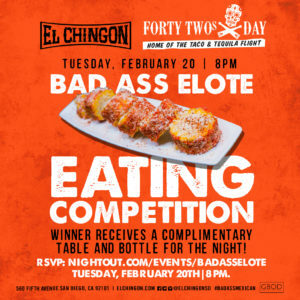 Put your skills to the test during our Forty-Twosdays Elote Eating Competition! FortyTwosdays is the ONLY spot to be in the Gaslamp! On February 20th, Craig Smoove + SH8K are in the house spinning all night long. In addition to this #badass lineup, we are going to be hosting an Elote Eating Competition! This Mexican twist on corn on the cob is delicious we agree, but can you eat it blindfolded? The winner receives a COMPLIMENTARY table and bottle that night! RSVP for a complimentary first drink and register for the competition here! In the mood for the VIP treatment for the night? For table and bottle service inquiries please contact: vip@elchingon.com.